Title Series: Ano Hi Mita Hana no Namae o Bokutachi wa Mada Shiranai. The last summer that fate had afforded her, Honma Meiko was just a child. Her friends called her Menma and made fun of her for being a crybaby. Carefree and innocent, she was not even aware of the complicated web of feelings developing between the members of their group. Before Menma could face her own feelings, it was time for her to say goodbye forever. Just as her smile had once kept the group together, the shadow she leaves behind becomes a wall separating her friends. And so, years after her departure, Menma is brought back by regrets and an unfulfilled wish. An existence not of this world, she cannot communicate with her old friends or help them even as she sees them drift further and further apart. 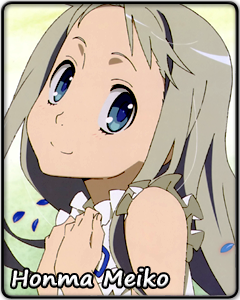 Menma steels her resolve. She will forget about her family and the fun she had while alive – those are things she can never get back. Instead, she will give her all to fulfill her final obligation to a friend. Even if it means saying goodbye and losing everything dear to her a second time, Menma's pure heart will not allow her to stop. With her own strength, she will leave behind proof of her existence.